Brewmaster Dan Jansen is looking ahead to Blue Point’s bright future. Blue Point Brewery is undergoing a literal shift. Over the next several months, if all goes according to plan, the entirety of the Patchogue-based brewery’s local production will migrate, piecemeal, from its original River Avenue location to a brand new brewery just south of Patchogue Lake—a straight-shot half-mile north along the Patchogue River. According to brewery co-founder Mark Burford, the new facility marks the third act for the 20-year-old operation—the first being its founding in 1998 and the second, its sale in 2014 to Anheuser-Busch InBev (AB InBev). 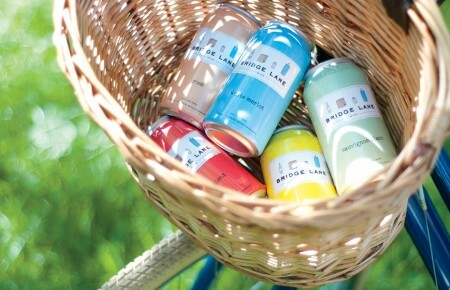 But with Burford having settled into a decidedly backseat role following the buyout, the Patchogue Lake brewery is largely the vision of Blue Point’s current brewmaster and director of operations Dan Jansen and his right-hand man Mike “Stoney” Stoneburg. 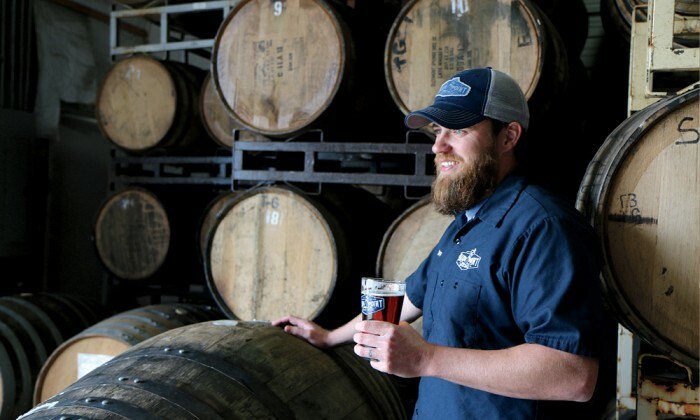 Jansen, a trimly bearded, low-key Midwesterner who’s brewed professionally for nearly 15 years, came to Blue Point just three years ago from Anheuser-Busch’s St. Louis brewery, where he worked as assistant brewmaster. He was looking for a more creative and experimental brewing experience than what he was getting in St. Louis, and through his contacts in The High End, the “craft” arm of AB InBev, got an offer to run Blue Point. “They really embraced me and gave me this opportunity to brew some new, exciting and creative beers, and to lead the production side,” Jansen said. The new brewery Jansen designed is positioned on the former site of the Patchogue Manufacturing Company, a World War II-era lace mill on Main Street in downtown Patchogue. The original compound, which suffered a series of fires in the 1970s and sat derelict until its demolition in 1998, featured a clock tower that rose above a sprawling, interconnected campus of brick buildings totaling more than 200,000 square feet. The modern building housing Blue Point’s new brewery is somewhat less stately—it was constructed in the 2000s as a commercial and retail property with recent tenants including Briarcliffe College and Flo’s Luncheonette—but a new clock tower pays homage to the site’s history. Inside, Jansen’s installed a sea of shiny new stainless-steel brewing equipment. At its center is a five-vessel, 60-barrel, German-engineered Rolec brewhouse capable of handling eight to 10 brews per day, up to 150,000 barrels annually. It’s a big leap for Blue Point, which currently brews just 10,000 barrels per year at River Avenue. Jansen said the plan is to start slow—he’s installed only enough fermentation capacity for roughly 60,000 barrel per year—and eventually fill up the extra fermentation space over time. This means an initial production increase of four to six fold. Also on display is a new hi-tech packaging line capable of filling 12-ounce bottles and cans for six-packs and 12-packs, 16-ounce cans for specialty four-pack releases, and 375-ml and 750-ml cork-and-cage bottles for limited one-off beers. The line’s automated kegging feature can fill up to 60 kegs-per-minute. That’s not all. A state-of-the-art QA lab will compare how beer made at the new brewhouse matches that from River Avenue. On the street level, a warm storage room for conditioning Blue Point’s famed cask firkins will be visible to passersby. 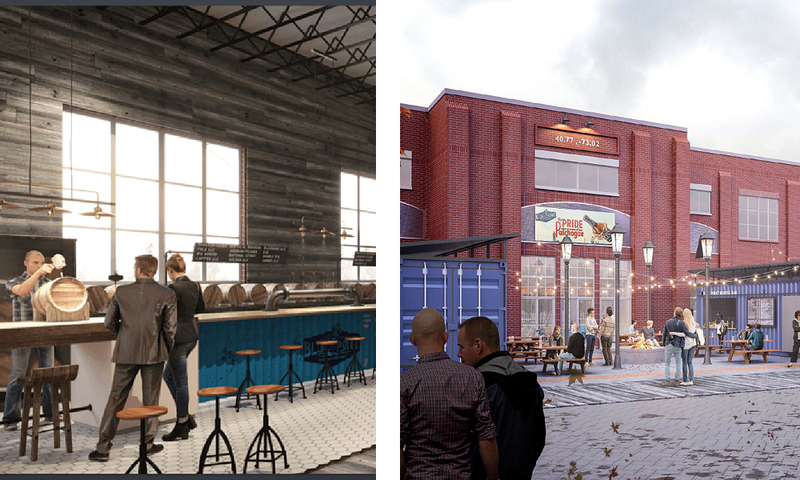 Later this summer, a new second-floor taproom and restaurant will open, with windows looking down at the production and packaging areas. In one corner, a raw oyster bar, and in another, a live music stage. More windows and roll-up garage doors will provide sweeping northern views of Patchogue Lake. The new facility will serve as a creative outlet for Jensen and Stoneburg, whose friendship dates back more than a decade. 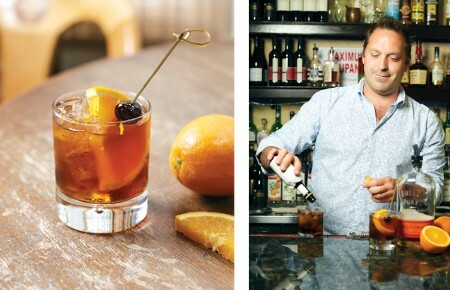 The pair met in the mid-aughts while working in St. Louis and soon began collaborating on recipes. “We started homebrewing together on weekends, after brewing [at Anheuser-Busch] all week long and coming up with different beers,” Stoneburg fondly recalled. They took different paths professionally—Jansen stayed in St. Louis while Stoneburg “went and made malt for a couple years,” he said, and then brewed in Chicago at Goose Island, another AB InBev/The High End subsidiary—before reuniting in Patchogue in 2016. The opening of a second-floor taproom is just one of the additions beer lovers have to look forward to later this summer. / The brewery’s new location will increase production and add to Patchogue’s bustling nightlife scene. Nearly all of Blue Point’s flagship Toasted Lager will continue being brewed at Anheuser-Busch’s national production facilities, allowing Jansen and Stoneburg the freedom to focus on small-batch brands like the honey and blood orange-infused Citrus Plunge IPA and Beach Plum Gose, a refreshingly tart sour ale brewed with sea salt and Long Island-harvested beach plums. Additionally, a new series called Catch of the Day will highlight brewery-only releases, while a rotating line of specialty oyster beers will be available in large-format 750ml bottles. In the meantime, Jansen and Stoneburg are hard at work getting the brewery up and running (the first test batches hit tanks in early May). And once the beer starts flowing from the shiny new taps, it will be a dream realized for the duo.